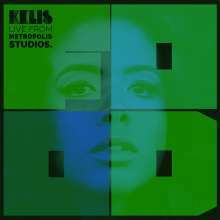 Der Artikel Kelis: Live From Metropolis Studios (180g) (Limited Numbered Edition) (Green Vinyl) wurde in den Warenkorb gelegt. Kelis is a Grammy nominated American singer-songwriter who has won countless Brit, Q and NME Awards outside the United States. Kelis has 10 top ten singles in the United Kingdom to her name and has toured extensively across the globe and supported numerous other international popstars including Moby, U2, and Britney Spears. On March 3rd 2014, Grammy nominated singer-songwriter Kelis performed an exclusive and intimate one-off show at London's Metropolis Studios, supporting her new studioalbum Food. The special show was recorded for this limited edition vinyl release. With a capacity of only 100 people, every ticket holder got to see Kelis live in her most intimate show of the year at this unique performance.